Our patio covers, which we install at homes throughout the Wilmington, Delaware, area, are designed to stand up to the elements and whatever else life may throw at them. At SRA Home Products, we are proud to exclusively install patio covers manufactured by TEMO, a company that has been leading the outdoor living industry since it was founded more than 40 years ago. Plus, when you have us install a TEMO patio cover at your home, you’ll get to choose among several distinctive architectural styles. Our patio cover style offerings include: pavilion; sunlight pavilion (which features a polycarbonate roof allowing natural light in); St. Thomas (which features a curtain wall with an optional retractable screen); and Santa Fe (which features pergola lattice running along the perimeter, along with the curtain wall). 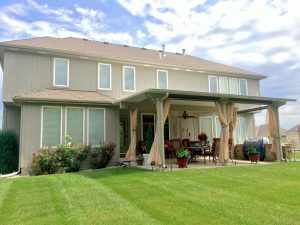 These many options ensure that you can design a patio cover that will match the style of your home and meet your family’s needs. If you’re interested in adding one of our durable patio covers to your Wilmington, DE, home, please contact SRA Home Products today. We’ve been family-owned and -operated for two generations — since 1988 — and we are committed to providing our customers with reliable products that they’ll be able to use for years to come.